Aesthetic fillings are the most frequently used method for the treatment of decayed teeth. The filling material is available in different colours. Your attending physician will select the most suitable colour with the help of a tooth colour code. The wide choice of colours facilitates the creation of the most perfect tooth colour, because the different shades are placed in layers into the shaped cavity. The lowest layer is similar to the colour of dentine, and going outwards the single layers are more and more translucent. 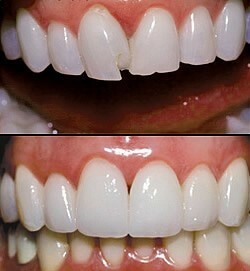 The transparency of the top layer resembles the transparency of tooth enamel. So the final result is a beautiful restored, tooth coloured filling. In which cases is the use of aesthetic fillings recommendable? How are aesthetic fillings prepared at the KG Dental Clinic? The procedure is carried out under local anaesthetic to numb the area around the affected tooth, so the treatment is painless. The decayed parts are removed with a special drill. The next step is to prepare the space that must be filled. This involves ensuring the cavity is thoroughly cleaned of bacteria and any other foreign matter. Besides the tooth colour can be specified, as well. The tooth enamel will be conditioned with a special jelly-like material. 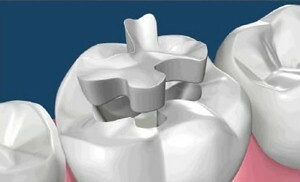 The purpose of conditioning is to increase the necessary area for the adherence of the filling material. The conditioned area is treated with a bond material. Bond is such a special adhesive, which fixes the filling material with the tooth tissue. A special polymerisation lamp is used for this bond material, which is essential for the material to harden. After this the filling is placed into the shaped cavity. The tooth-coloured material is added in a series of layers. A special light source is used that hardens each layer as it is applied. When this process concludes, the dentist can shape the composite material to achieve the final result, trimming away any excess and then polishing. What to do if you need aesthetic fillings? Aesthetic fillings are the easiest and fastest solutions for most common dental problems. Visit our clinic and ask for a consultation appointment in order to preserve the health of your teeth with aesthetic fillings.